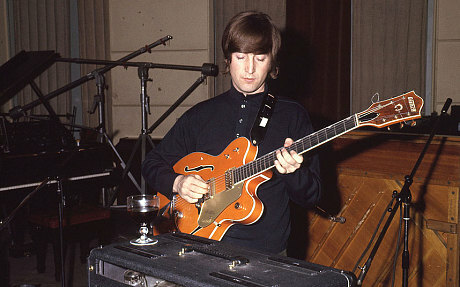 John Lennon’s Gretsch guitar played on the recording of “Paperback Writer” can be yours. This peace of Beatles memorabilia will be auctioned by TracksAuction.com on november, 23rd, 2014 at 2:00pm (GMT), Le Méridien Hotel, Piccadilly, London. 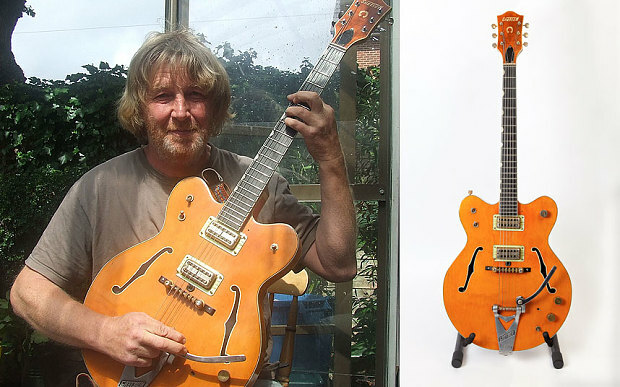 The Gretsch 6120 is expected to fetch around US$ 1,000,000. The guitar was a gift John Lennon gave his cousin David Birch in 1967. Birch explained to The Telegraph how he got this unique gift from the Beatle. Since David was trying to form his own band he asked if John had one guitar that he no longer wanted. As he puts: “I was just cheeky enough to ask John for one of his spare guitars”. His eyes were on a blue Fender Stratocaster but John gave him the Gretsch, making Birch the second owner of this guitar. There are a number of black and white photos taken by Leslie Bryce of Lennon using it during the “Paperback Writer”. The details on this picture confirm that it’s really the same instrument John used on the session on April 14, 1966. The auction has more than 100 lots of Beatles memorabilia.